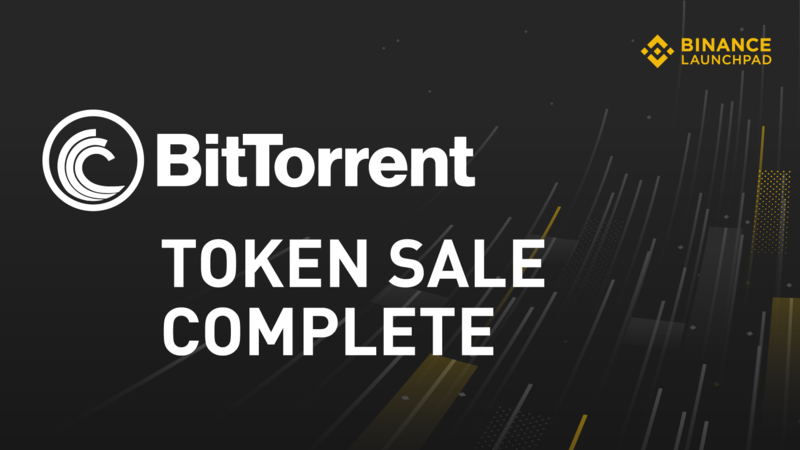 Binance Launchpad, the exclusive token launch platform of Binance, has completed the sale of BitTorrent (BTT) tokens, which began on January 28, 2019, at exactly 3:00 PM UTC. The token sale ran in two simultaneous sessions: one for purchases using Binance Coin (BNB) and another for purchases using TRON (TRX), both of which were concluded quickly. At the time of the sale, one BTT is priced at 0.00001824 BNB or 0.00447261 TRX. In other words, 1 BNB can buy 54,824.56 BTT, while 1 TRX can buy 223.58 BTT. Participants were able to purchase between 100,000 BTT (the minimum amount eligible for purchase) and 166,666,666 BTT (the maximum amount). For more information about BTT, please read this comprehensive paper completed by Binance Research on the project. * Users from the following countries aren’t able to participate in the BitTorrent token sale on the Binance Launchpad platform: Afghanistan, Albania, Belarus, Bosnia & Herzegovina, Burundi, Central African Republic, Cote d’Ivoire, Cuba, Democratic Republic of the Congo, Ethiopia,Guinea, Guinea-Bissau, Iran, Iraq, Lebanon, Liberia, Libya, Mainland China, Myanmar (Burma), North Korea, Republic of Macedonia (FYROM), Serbia, Somalia, South Sudan, Sri Lanka, Sudan, Syria, Thailand, Trinidad & Tobago, Tunisia, Uganda, Ukraine, United States of America (USA), Venezuela, Yemen, and Zimbabwe. This list of excluded countries may be subject to change and may vary from project to project. This post does not constitute investment advice nor should it be misconstrued as such. Certain information set forth in this post contains forward-looking statements and are not guarantees of future actions by Binance or any of its affiliates. All investments are subject to high market risk. Please be cautious when making your investments. While Binance Launchpad exerts utmost care in choosing and supporting transformative blockchain projects, we will not be responsible for any investment losses.